As an experienced florist and designer, I pride myself on my work and most importantly, I am very passionate. Not just passionate about flowers, but about working closely with all my clients to really listen and understand their needs and ultimately making their vision come to life, whether that is a special bouquet or creating floral designs for your dream wedding day. I have a Textiles Fashion degree from Winchester School of Art; my passion for flowers enabled me to specialise in floral print and design, with commissions for both Habitat and Marks & Spencer. 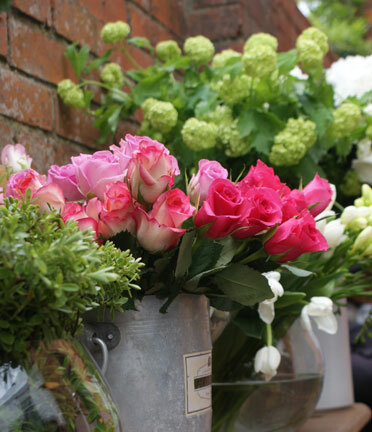 My training at the Judith Blackthorn Flower School in Knightsbridge, London, provided me with a wealth of knowledge. This, coupled with years of experience, has nurtured my belief in the philosophy of using only high quality flowers and paying attention to every last detail. This approach is really paramount to me in delivering a unique, one to one personal service. Harrison & Green is run from two home studios, which means fewer overheads for me and much more flexibility for you. Hence I take pride in working with all my clients to create beautiful floral designs with maximum impact to suit every budget, however big or small – everyone is important to me. For more information or consultation please, feel free to contact me on Studio 01635 32705 or Mobile 07811 450744.